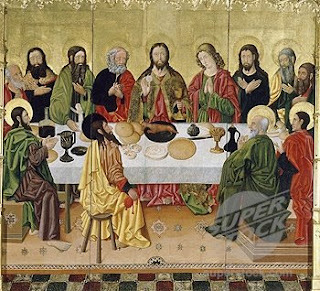 The number twelve is so important in Holy Scripture that it would be extraordinary if the number present at the Last Supper with Jesus was more or less. In Hebrew tradition the number signifies the "perfection of government" so that it has something to do with "rule" or authority. We know that the number twelve signified the whole of Israel (twelve tribes) and therefore represents the whole people. In the Apostles we therefore have a sign of the Kingdom and of the Church, ultimately encompassing everyone. This suggests to me that the Last Supper was only for Jesus and the Apostles. This has nothing to do with "fairness" or some imagined slight against women. The significance of the Twelve relates to the Patriarchs (all men) and because of the identification of the one man Israel with the whole people, and the fact that "all are seen in the head" the significance of the Twelve includes all, both men and women. The apparent lack of the physical presence of Our Lady or Mary Magdalene does not mean that they were not "present" in some other way - as members of the One Body or as "Daughters of Israel", being represented, in this case, by Jesus with the Twelve. "You know that the rulers of the Gentiles lord it over them, and their great ones are tyrants over them. It will not be so among you; but whoever wishes to be great among you must be your servant, and whoever wishes to be first among you must be your slave; just as the Son of Man came not to be served but to serve, and to give His life as a ransom for many". I checked with a Hebrew scholar and it is true that the two phrases found in Genesis and Matthew, which can be expressed as, "lord it over", have the same root. Adam rules Eve and this is a consquence of sin. The inequality between the sexes is a result of Adam and Eve's sin. Christ repairs this by doing the opposite of the first Adam. Christ becomes the servant. The Master is the Servant. Only in this way can reparation be made, and the priesthood established by Christ is the priesthood of the New Adam. This can only be expressed through the male since there must be a relationship between Adam and Eve, Christ and the Church, husband and wife. In a particular way it remains necessary for the ministerial priesthood to be male only. The male (Adam) is a servant, even to the giving up of his life for the female. St. Paul understood this; he speaks of Christ giving up His life for the Church and links this sacrifice with the love a husband should have for his wife. In all this there is nothing about denigrating women or seeing them as second-class citizens. It is not only unnecessary for women to be ordained, it is unbiblical and distorts our understanding about the work of Salvation. (I leave aside other arguments against women's ordination here, though I may return to them later -there are more than one!). With all this, we can see that there are very important reasons why the Last Supper was "only" for Jesus and the Apostles. Let's consider the defection of Judas. Before Judas goes out, Jesus is the Head, but not one of the Apostles. After Judas defects, Jesus becomes one of the twelve - the best one; the perfect one. Jesus not only takes the place of Judas, He begins to repair the damage done by Judas by taking upon Himself not only Judas's sin, but the sins of all, and acting as the true disciple Himself, being also the New Adam and the perfect Son of Man and Son of God. Thus His obedience to the Father is perfectly expressed in His willingness to take on Himself all that needs to be done to repair the damage of sin. If Judas had only known that his sin had been taken to the Cross and that Jesus had fulfilled for Judas the vocation he had been given from the beginning. Judas was set free by Christ, but was unable to accept this. Jesus had already shown what it meant to follow Him by washing their feet (including the feet of Judas). He took this lesson in humility and service to its horrendous conclusion, carrying the others with him even though they scattered. They all found themselves once again - in Him. We can see then, that as Judas left, there were still twelve Apostles at the Table, Jesus now taking upon Himself, the vocation of an Apostle. This is linked to His Priesthood being the source of every priestly ministry. I find my priesthood in His. Without Him I have no priesthood. Jesus, being the perfect Hight Priest is also His own perfect disciple, being true to Himself, a Servant of the Truth and a perfect Son of the Father. After the Resurrection it became necessary for another to be chosen to make up the twelve. It is essential then that we recognise the significance of the Apostolic College and that we understand how the twelve form the foundation of the Church.